Lighting a fire is a skill. Some people have it and some don’t. A relation of mine for instance can light a coal fire with rolled up newspapers. On the other hand, other people I know, find it difficult to light kindling. But its an easy skill to acquire, especially with the right materials at hand and a bit of trial and error. However, if you have no kindling it can be impossible for anyone. Types of kindling. Softwood is usually best for kindling as it lights easily, burns quickly and is relatively straightforward to split into small pieces. But interestingly matches are made of hardwood as this burns more slowly. Pieces of kindling with edges expose more surface area and light easier. Therefore, where possible, kindling pieces should have sharp corners. If round pieces (branches) are all that are available, they should ideally be quartered to help them burn. Kindling supply. I am quite poor at maintaining a supply of kindling and frequently run short. I usually use thin strips cut from logs. But making kindling this way can be tiresome. As an alternative a friend of mine makes his own kindling by using a wood chipper. He uses this to chip the small branches of trees he fells. Once dry this ‘mixture’ makes excellent kindling. Another alternative is to use a log splitter with the steel kindling grille attached. This is great at turning softwood logs into kindling sticks. You can of course buy kindling. Most firewood suppliers, shops and garages sell it in small bags. But it can be very expensive buying it this way at the local convenience store, especially for the usual small quantity of wood involved. While it goes without saying that the kindling should be dry, but I have seen kindling for sale in shops in plastic bags dripping with condensation! Stacking and lighting. 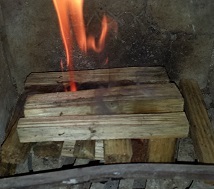 Lighting a fire with two or three layers of kindling, stacked on top of one another, usually works fine. Each layer is placed at right angles to the one below, with gaps left for the flames. I usually put logs around the stack of kindling, this helps to keep it in place and supports the logs above. Kindling is something that you can be very wasteful with. When I have a good supply, I use loads; but when it is in short supply, I can easily start a fire with very little. I should really use a little all the time and stretch the supply. 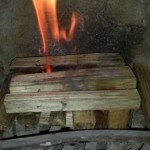 There are of course other ways to stack the kindling and start the fire, see here for the upside down fire method. Lighting the tinder. I sometimes cheat and start the fire with a small piece of fire-starter as the tinder, but I also use paper and junk mail other times. Some people use wax, threaded paper and whatever else is at hand. Once the tinder is lit, the stove air supply be kept wide open until the fire has caught fully. The firewood above the kindling should be burning well before the stove air supply is restricted. Ash. Most of the ash from the previous fire should be cleaned out from the fire tray to ensure the route for air supply to the fire is kept free. But relatively little ash is produced in a stove when using well seasoned timber. I usually dig the ash into the garden once it has cooled. Therefore I try not to use fire-starters much, as I would imagine, the residue of burnt fire-starter can’t be good for the garden soil. What do you use for kindling? Anything unusual? Very interesting and enjoyable reading. My husband usually complains when I set the fire as he can set it with so little material. I look forward to showing off my new skills.